One of the more clever phrases ever created is “Not in my backyard” or NIMBY. This pejorative phrase has been used to quickly characterize someone or some organization that is opposed to a particular project. The phrase is supposed to make you think that the entity so characterized is a selfish unevolved slob that stands in the way of the kind of progress that will benefit humanity. This may be what you think when you hear the term. This is often not close to the truth. Campaigns or spokespersons for campaigns that use that slogan are most often financed and carried by a monetized agenda against those that stand up to prevent themselves and others from harm caused by that agenda. The NYMBY is the obstructionist. Even though that NIMBY may in fact be operating from a knowledge platform that challenges the point of view that the development or project is harmful and not beneficial. In my mind, NIMBY carries a heroic connotation rather than an obstructionist one. Standing up against the tyranny of the perceived majority, defending ones own property investments, and defending a community against a predatory wealth extractor that brings harm for generations to the planet are patriots engaged in constitutional freedoms that many generations of Americans have fought and died for. The crusaders that champion the use of NYMBY characterization against the brave souls that risk everything to stand up to the onslaught are often the apostles of the extreme anti-environmentalists that evangelize an anti-democratic and anti life philosophy in favor of social, ecological, and often economic destruction for many people on the planet including Americans. I first heard the phrase back when lumber and paper interests were trying to eliminate those arguing against clear-cutting our native ancient forests in the 1960's and 70's. It became a huge media meme and these earlier versions of television media delivered the message, profoundly. There were forcefull protests going on around the world relative to clearcutting forests. American and Canadian media could get images of protesters and violent actions by security forces against them, and these images were appearing on the nightly news shows. Local, Federal, State, partnered with private security forces. The stakes were high for the companies making profits from the clear cutting. Protesters were willing to put their lives on the line to prevent the takings. Some were non-violent and were engaged in civil disobedience. American's had just been through a decade of nightly television news images of the Vietnam War, and many credit these media imprints with turning the American public away from supporting the war. Everyone knew how important message control is. Sloganeering is the groundworks of political engineering. The pro-industry propagandists used the phrase "NYMBY" to describe and marginalize protestors and critical opponents. One of the results was the widespread recognition of the "Silent Majority" that had begun to awaken during the Vietnam War coverage. In the newly dawning media age, propagandists exploited every advantage. The Silent Majority was a huge marketplace, and the product to sell to them was for them to remain silent. It was and remains an aggressive sell. Marginalizing political opponents, including friends and family of those ensconced in the silent majority worked well. Divide and conquer is hardly a new tactic- but it is part and parcel of how the NYMBY theme came to be. Creating and delivering the message always results in power. It exists as a tactic and a strategy nearly where everyone encounters dialogue. A new phrase has begun to emerge in recent months, a phrase that is proudly waived as a banner by advocates for a saner and just world including climate change activists, renewable energy activists, habitat activists, and the 99% represented by the occupy movement. That phrase: NOOP. Not on our planet! I dont think the phrase has a chance, but I like it. I will use it every chance I get. Publicly funded police and military forces have a long held tradition of defending the oligarch’s interests from the 99%. The violent clearing of occupation sites across the America and the world in recent months should outrage any citizen that has a child that wants a future that works. Privatization of police and military forces funded by taxpayers and bolstered by laws that many think abrogate the Constitution, have eroded accountability and responsibility while increasing suppression and harm to American citizens here and abroad. One small sampling of how we blind ourselves to truth involves the dangerous and caustic agent- pepper spray. It is advertised as “humane” in the same way that rubber bullets are advocated as “humane.” These are crowd control devices. Compared to National Guardsmen opening up on the kids at Kent State, it may be a more fair comparison, but pepper spray and rubber bullets are part and parcel of the violent and repressive actions that a police state is willing to terrorize peaceful citizens with. And they do cause physical harm and injury. Sometimes it is permanent. The use of these agents against peaceful citizens that are engaged in their constitutional rights is reprehensible and undemocratic. More and more and under the guidance of secret Homland Security initiatives, local police forces are becoming more militarized. This is a deeply disturbing development. 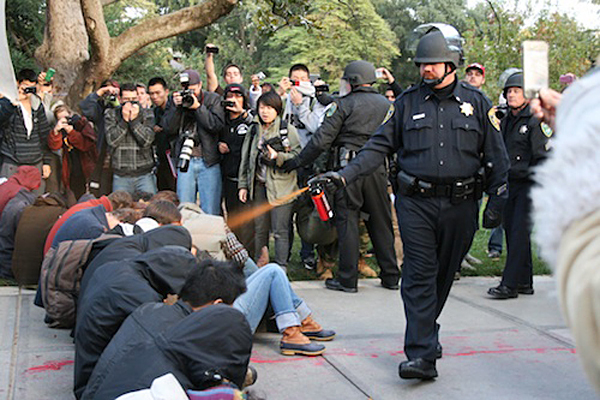 When the UC Davis security forces recently used pepper spray against defenseless students, following weeks of other police forces using the substances on occupy protestors, Fox News aired a snickering yuk yuk story characterizing pepper spray as a harmless “food” substance. By some accounts the report made people think that pepper spray is a nutritional and edible product. It is not. It is designed to stop and disable an adult human. Rachael Maddow on her MSNBC show came up with a really good analysis of the real impact of commercial pepper spray used by police forces at all levels. She described that the chemical heat that comes from peppers is from a substance called capsasin. She displayed a chart called the Scoville Scale, designed by Wilbur Scoville to compare the powers and strengths of capsasin in various peppers and substances. Workers handling this use gloves. Deborah Bloom, author of the book “The Poisoners Handbook” says that commercial pepper spray is off the charts in terms of chemical power. The capsaicin is not only designed to disable a person but when sprayed into eyes causes a caustic reaction including cellular disruption, pain, and immediate shock. Repeated exposure to pepper spray can cause permanent damage to eyes, skin, and the repertory and nervous systems.